The Canadian government is working with financial services companies to enable consumer’s to use bank-issued credentials and payment cards for access to government services, negating the need for special purpose IDs and passwords that are infrequently used and thus difficult to remember. Toronto-based SecureKey Technologies was hired by the Canadian government to launch the credential broker service. The broker service is designed to protect consumer privacy, says Andre Boysen, executive vice president of Digital Identity and Authentication Services at SecureKey. Canada is looking for an easier way to give citizens a choice about how they access services online, he explains. “When a consumer uses the service, the government does not get any information about the bank that you’re coming from or your account details,” Boysen says. “Nor does the government give any information to the bank about what government program you’re accessing or for what purpose.” SecureKey sits in the middle and doesn’t know anything about the user’s identity. Consumers will be able to visit a government department online and go through the credential broker service for authentication. SecureKey is launching with three of the largest banks in Canada–BMO Financial Group, TD Bank Group and Scotiabank–and plans to add more in the future. Canadian citizens have a choice of whether or not to use the system. When they visit a government site they can choose to create a new login that is unique for the government application or use their banking information. If they choose the latter they are directed back to the bank site, asked to login and provide required identification information. Once verified, they are able to use the user name and password from their bank for access to the government site. When a user authenticates with their bank, the bank will give SecureKey a non-identifying security token. SecureKey then substitutes the token with a new non-identifying but unique token for the Government of Canada that says the user has been authenticated. The CBS service is ‘triple-blind’ so no party to the transaction knows who has provided precisely what, thus ensuring the user’s privacy. SecureKey is simply a broker of anonymous credentials. The Government is responsible for ensuring that it is you accessing your information. The bank is responsible for providing a valid security “token” that only you have so that you connect to Government services more securely. Boysen says they’ll start with things consumers already have–a user ID and password. But other more secure options are also available including contactless payment cards and contact EMV cards. One of the bank partners issues contactless smart cards in the market. “We’ll use our SecureKey reader so that users will be able to tap a credit card in addition to a password and get access that way,” says Boysen. For the brokerage service to be successful, users must be convinced that their information is private and safe. Boysen says the interest of the banks is to serve customers and not be invasive. He says users should find comfort knowing that any authentication solution relating to consumer information must get the approval of the Privacy Commissioner of Canada. In the end, the goal is to provide an efficient, effective mechanism for consumers to safely identify themselves online. “We’re trying to work with the most trusted players in the economy,” Boysen explains citing governments, banks and eventually telecom companies. Brooks agrees, adding that the Internet is crying out for this kind of solution. “Government organizations are getting a bit desperate to find services and solutions that don’t reinvent the wheel, that they can just pick up and run … and that are proven,” she says. 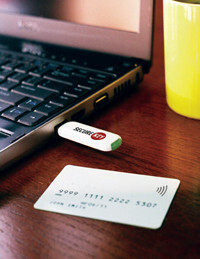 SecureKey expects the credential broker service to go live by mid-2012. It will be available for all Government of Canada departments and agencies. The service is free for Canadians with the cost being borne by the government.